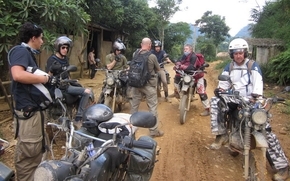 Just a short note to say thank you for the adventure of a lifetime that myself and 6 mates have just had riding with Explore Indochina through northern Vietnam. The 7-day 'Mountain High' ride exceeded all of our expectations! Our trail guide (interpreter, mechanic, chef, medic! Etc) was superb! Nothing was ever a problem and he capably kept the ride flowing along nicely. The wonderful people we met along the way, the villages we passed through and the beautiful Vietnamese countryside we have seen are memories that will stay with us for a lifetime. We are already planning our next adventure with Explore Indochina!